There is an interesting healthcare article in the news this week about doctors who decide to stop playing the insurance game. A few years ago, we decided to take the self-pay route for our primary doctor. Actually, the doctor quoted in the article, Craig Koniver, IS our doctor. He went to this mode of practice two years ago, and last year pared his staff down to one - himself. My family is fortunate to have medical insurance coverage. 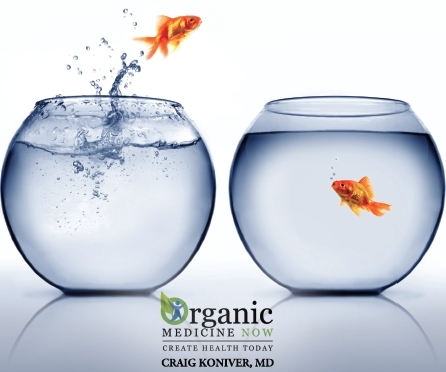 But we chose to stay with Dr. Koniver because his approach to care has revolutionized our health. It's that simple. And that amazing. Break Free of the System! Dr. Koniver describes it as partnership. He uses his knowledge of traditional and organic medicine along with his personal relationship with us to guide us in taking care of our own health. We trust his advice, knowing it is based on a holistic approach to our well-being, not on a need to satisfy coding requirements or pitch product. The upfront cost is surprisingly affordable. And since the cost is controlled and agreed to up front, there are no nasty surprises from insurance companies denying charges because such-and-such was coded wrong or excluded by our plan. He is amazingly accessible. And we no longer feel like just a number in an EMR system. We have his direct phone number and email. When we send him a message, he's back in touch within minutes. When we visit, we have as much time with him as we need and we converse on a first-name basis. He knows exactly who we are, what our lives are like, and what we're struggling with, even before he consults his whizbang iPad chart. When he asks how we are doing, he means it, and he wants to know not just our physical state, but how we are mentally, emotionally, and even spiritually. Because it all matters and has an impact on our health. My husband was diagnosed with Type 2 diabetes ten years ago and has had an ongoing struggle with controlling his blood sugar. Our prior caregiver would look at his numbers, nod as my husband voiced his concerns, then prescribe one drug on top of another. We are not opposed to pharmaceuticals and are grateful for medical advances, but after a few years of being pelted with pills - including one that was later taken off the market - we thought there had to be a better way. We wanted a holistic doctor who would LISTEN to us and would do more than just try to mask our symptoms with pharmaceuticals. Once we found that in Dr. Koniver, there was no way we were going back! The importance of this approach became more evident this year. After getting to know my husband, following his struggles with his blood sugar, and doing some in depth research, Dr. Koniver suspected the possibility that my husband had been misdiagnosed with Type 2 diabetes. He sent us to a specific endocrinology specialist in Atlanta, whose tests verified that he had the marker for Type 1, not Type 2. No one else had ever looked at the numbers and suggested that maybe there was a reason why traditional treatments weren't improving his condition. Obviously Dr. Koniver has not abandoned all that is good in traditional medicine. He uses everything that is at his disposal to make the best recommendations to his patients. We still use certain pharmaceuticals to treat ongoing conditions. But we prefer to use organic supplements when possible to avoid increasingly expensive pharmaceuticals with questionable side effects. (Seriously, have you ever listened to the rapid fire side effects list on those commercials?) Dr. Koniver even has his own line of organic supplements. He doesn't push them, but we use them because they make a difference, we trust the source, and they're less expensive/higher quality that what you find in the market. And they work. My husband and I are in much better health now than we were five years ago because of them. And as my husband would say, if it ain't broke, don't mess with it! It's refreshing - and inspirational - to have a doctor brave enough to defy conventions so he can fulfill his true calling of helping people reclaim wellness. He won't get rich this way, but he makes a good living and he spends a lot of time with his family, including his doctor wife who left practice to home-school their kids. Then again, that might just make him the richest doctor in town.